Mercury is a silent film which revolves around a bunch of friends who come together for a reunion in a secluded but breathtakingly beautiful place down south. They cannot talk and hear as a result of Mercury poisoning but that doesn't stop them from enjoying their lives to the fullest. However, on the very first night of their reunion, something unexpected happens which shakes them to the core. The untoward incidence is going to have serious repercussions on them. What have they done? Is their life in danger? To know more, watch the film in cinemas on 13th April. The film is headlined by multi-talented Prabhu Deva. But despite his presence, Mercury remains an extremely average film. No matter how talented an actor is but if he has been given a feeble character to perform, nothing can stop the movie from falling apart. The same happens with Mercury. In spite of a towering talent like Prabhu Deva, the film just fails to give you any chills. His character is poorly written and has no depth. The film does no justice to its genre and is very sketchy. Talking about other artists, Sananth Reddy and Indhuja do good job among the rest. Karthik Subbaraj is a popular director down south, who has films like Jigarthanda and Iraivi to his credit. His latest flick Mercury is very experimental in nature. It could have turned out to be a total mess had it not been handled intelligently by a competent director. Unfortunately, the same happens in spite of the fact that it had Subbaraj at the director's chair. The director tries to keep the film as simple as possible and while attempting that he ends up missing the plot wholly. He fails to utilize the talent of Prabhu Deva to the hilt. Mercury has some moments which make you enjoy the film but sporadically. But if you look at the film in totality, it is a complete waste of money and efforts. There are no serious jump scares. The film could have been a masterpiece but falls short of meeting its goal because of its weak story and loose screenplay and poor execution. Cinematographer Tirru, who won loads of appreciation for his recent work on Vanamagan, has done a decent job. VFX and CGI work of the film is okay and had scope to get even better. The background score is quite appealing and adds thrill to the movie. Editing could have been better. 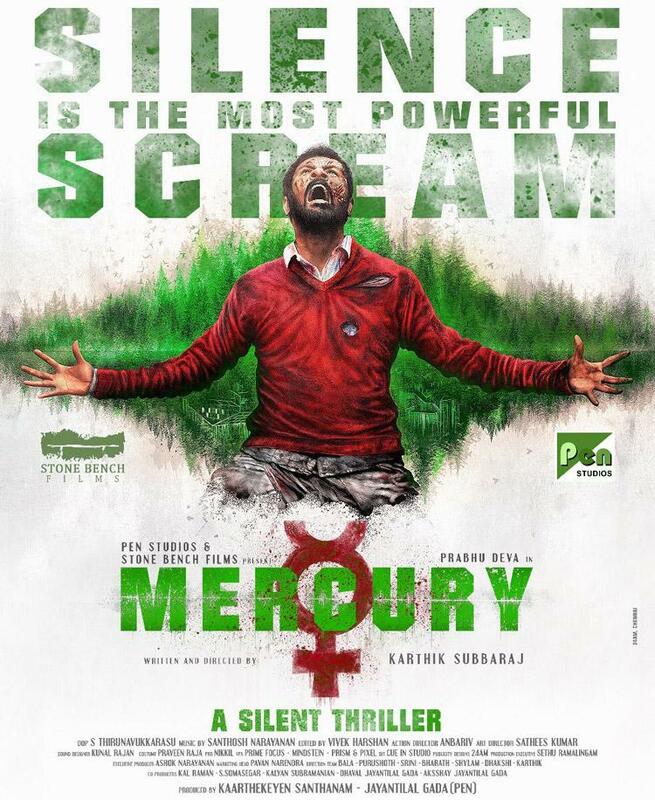 Overall, Mercury looks like a half-baked thriller. There is no song in the film as such, but only one promotional single "The Mercury Song" which was released recently. Composed by Mithoon, it has been sung by Haricharan and Gajendra Verma while lyrics have been provided by Sayeed Quadri. Watch this film only if you have enjoyed watching silent films before. This is not your typical masala entertainer, and hence offers nothing much to keep you hooked to your seats. Remo D’Souza signs Varun Dhawan and Katrina Kaif for the biggest dance movie ever! The rib-tickling trailer of ‘GujjuBhai – Most Wanted’ out! Adah Sharma to star opposite Prabhu Deva in a Tamil film!